Kaholong (white opal) - stone of milky-white color, being the opaque variety of porcelain-like opal, at times he is named a pearl opal or semiopal from low maintenance of bound-water. 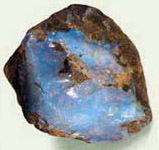 It a transitional form opal. Kaholong (white opal) opaque, porcelain-like or enamel-forms, honey yellow, amber-white, appearing at the loss of water, due to what he is sometimes attributed to chalcedony. 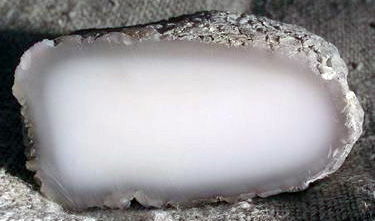 Kaholong (white opal) of organogenic, rich in a calcium, can pass to the chalk (this type especially actively and voraciously takes in moisture). An interesting variety opal, sometimes a few porous and sticking to the language (slightly biting for a language). 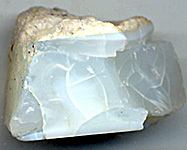 Kaholong (white opal) is an inexpensive opal which can be used for jeweller insertions, hand-made articles or to be useless for treatment. Are fully opaque or slightly translucent minerals. Losing of Kaholong some types actively absorb moisture, but are afraid of water, and after get wet and drying out can even crack (photo on the right down on the right). Kakholong of other type, vice versa, waters and get wet are not afraid (photo down on the left). There is a version, that his name is formed from the Kalmyk words of kahe (river) and halong (stone). 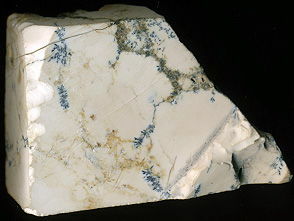 Therefore White Opal Kalmyk Agate name differently. On other version the name of stone originates from the Turkic word of kanlon (wonderful stone). In Mongolia White Opal equates with a lotus - sacred flower in a buddhism, by character of heartfelt cleanness and purity. In India this stone honour for his whiteness and name petrifying milk of sacred cow. Besides the afore-named countries of deposit of kaholonge exist on territory of Russia, in Kazakhstan and Middle Asia (CIS), in Iceland and Armenia. 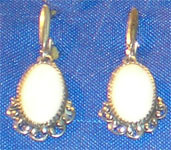 Jewellers usually prefer to mount White Opal in silver. Kaholong (white opal) symbolizes the clean state of the soul and ideas. Womanish stone. Stone of nuns and monks. It is considered that White Opal strengthens welfare and health, brings the world and rest in a house and family. It is character of cleanness of thoughts, this stone it is good to apply for clearing of consciousness during meditation and for a fight against the anxious states of psyche. Therefore amulets with Kaholong advise to apply at meditations, in the period of spiritual concentration, for purging of mind from anxious ideas.